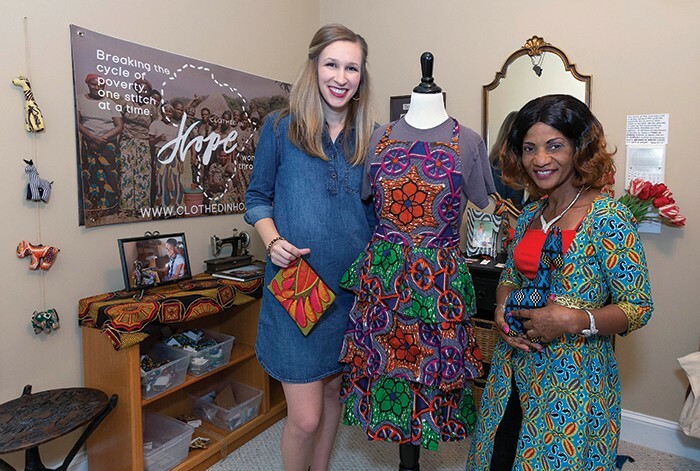 Clothed in Hope founder Amy Bardi, left, and Elina Kamanga, the nonprofit’s point person in Zambia, work with women in Africa to teach sewing and business skills. It’s morning in Lusaka, Zambia, and 45 women are already hard at work, learning to sew. This isn’t an extracurricular activity for these women; it’s a matter of life and death, or of feeding their children or having to send them to an orphanage. Meanwhile, nearly 8,000 miles away, the founder of Clothed in Hope, the founder of the nonprofit behind the life-changing classes, is equally hard at work. 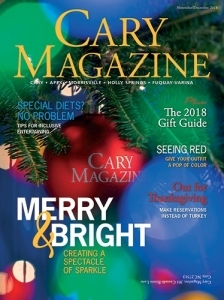 From her Fuquay-Varina home, Amy Bardi concentrates on managing the website, fundraising and other duties. Students make clothing, jewelry, purses, toys and more – all of which are available for purchase on the nonprofit’s website. In 2010, while a student at the University of South Carolina, Bardi went on a mission trip to Zambia with a group of other college students. The group stayed in a relatively affluent section of the capital Lusaka, but she also visited Ng’ombe, a nearby slum. Donate through Hope Club with a one-time or continuing donation. Purchase products, available on the website, that are made by the women of Clothed in Hope. Host a home party for friends. You and your guests can enjoy Zambian food and will receive materials to make bracelets while learning more about Clothed in Hope. 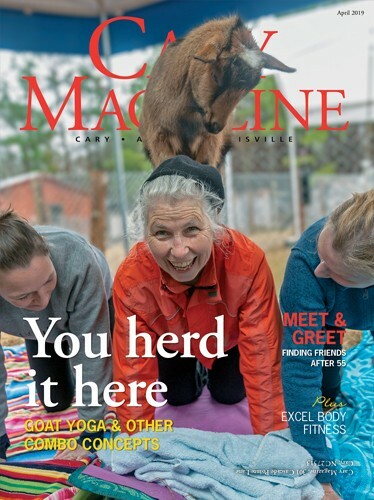 “There I saw 120,000 people, many of them single mothers, living within two square miles,” she said. Residents had no electricity or running water and rarely ventured beyond their tiny microcosm that included schools, churches and shops. Some women were in abusive relationships with nowhere to turn for help. She also visited an orphanage, where children were cared for because their mothers were too ill or too poor to care for them. She couldn’t forget that visit to the orphanage, and when she returned to the United States, she abandoned her budding career in the fashion industry. With a ton of faith, a lot of naïveté and a little bit of crazy, Bardi says, she founded Clothed in Hope in 2011. Her mission was to empower vulnerable women, primarily mothers, through training in sewing, entrepreneurship and life skills. 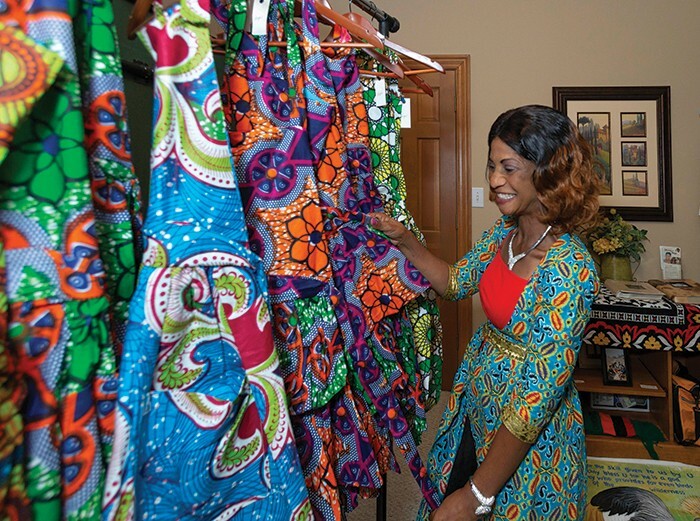 Elina Kamanga, who was in North Carolina recently for several speaking engagements, shows some of the aprons made by Clothed in Hope students. Bardi raised roughly $35,000 from family and friends to launch this mission. In Lusaka, she connected with Elina Kamanga, who speaks English, to manage the program from Zambia. Together the two created the curriculum and format for the program’s classes, which were to be held twice a week in the Chikondi Community Center in Ng’ombe. They would accept 15 students who would be trained in all aspects of sewing, running a business and even health and disease prevention. The organization would provide thread, fabric and sewing machines — primarily treadle machines since electricity was often unavailable. They hired a local woman tailor, Fridah Mulenga, to teach the classes while Kamanga manages all other aspects of the program. 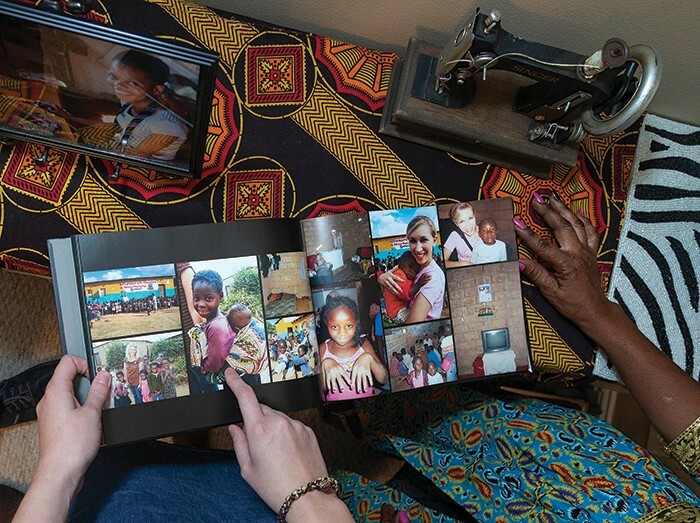 The sewing and business classes have a direct impact on families in Zambia. Because they are able to make a living, mothers can care for their children and pay for their schooling. The students make clothing, jewelry, purses, towels, napkins and more. They also learn the skills required to run a business — bookkeeping, profit and loss, balancing a checkbook and marketing their products both in and out of their community. Upon completion of the course, graduates can apply for a microloan to open their own businesses. So far, 75 women have received microloans, most focusing on tailoring and alterations, while others have diversified to include managing grocery stands, selling secondhand clothing and even chicken farming. 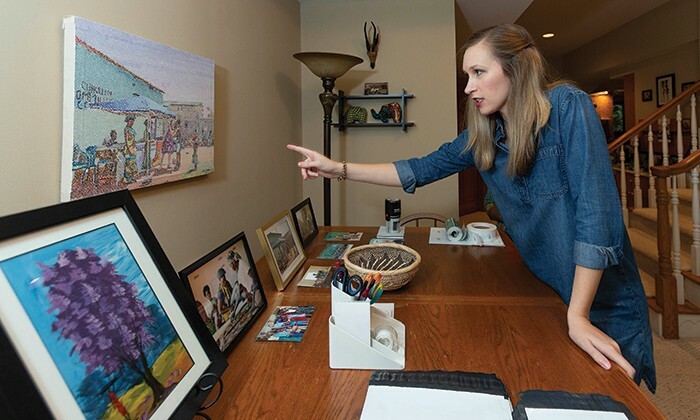 Amy Bardi points out mementos of her many trips to Africa, displayed in her parents’ Cary home. This program has also empowered Kamanga, who says her family now eats three meals a day, whereas they previously only ate one. She is also able to pay her children’s school fees, make their uniforms, and buy land where, ultimately, she plans to build a house. “I am who I am today because of this program,” she said. 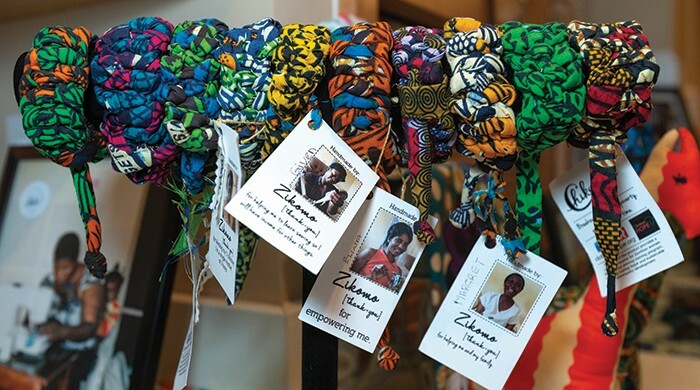 Clothed in Hope has expanded to four Lusaka locations, and Bardi hopes to eventually move into more locations, even other countries. Assisting Bardi and Kamanga are Kathy Woodell and Meredith Walker in North Carolina and 13 staff members in Zambia. Funding for the organization comes from customers, donors and supporters. “Everyone can’t live in Zambia, but people can still make a difference right where they’re at,” said Bardi.